What is happening with the milestones on the Camino? Everybody knows that the Camino is a network of kilometric roads and paths, so many times it is also hard to know where you are and you can get lost easily. However, to guide the pilgrims on their Camino there are stone markers nestled in the undergrowth every kilometer, which denote the remaining distance left to reach Santiago; yellow arrows painted on walls, doors, and fences, pointing the right direction; shell designs in the metal railings and pavements underfoot, just to ensure us that we’re in the right place. 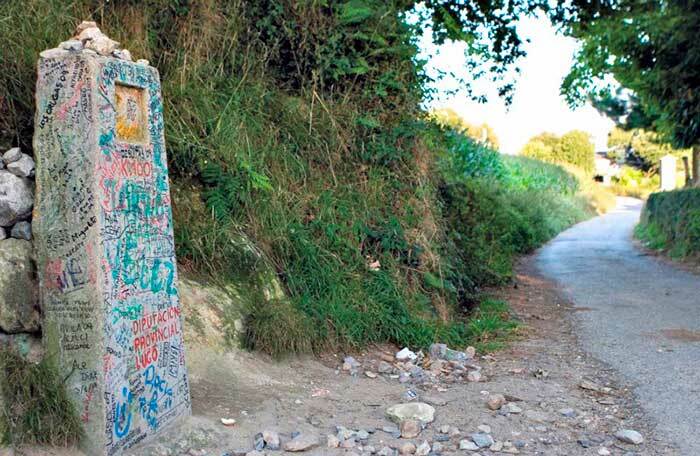 In Galician region of the Camino Frances, there have been milestones since 1986. They have been very useful for pilgrims to know the distance left to Santiago, as we have already said, but they have also been criticized since they were not very accurate about the information they offered. In this way, it was Unesco´s command to update the signing on the Camino since the Camino Frances, Northern Way and Camino Primitivo are World Heritage sites. 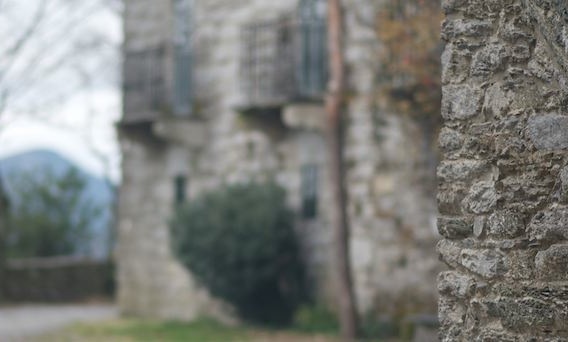 Galician government has started to remove the old stone markers on the Camino this January. These new milestones are very similar to the old ones, but rather than being a distance apart, they are located in a geographically strategic point and take the guesswork out of intersections. There is a place in each one for two plaques. So far I have not known exactly what they are for but it is probably a place name on a standard symbol, like the scallop shell and the small plaque will be the distance like the markers on the Camino Portugues. There has been quite some discussion on social media over the past few days regarding the decision to remove the original milestones and replace them with new signs. 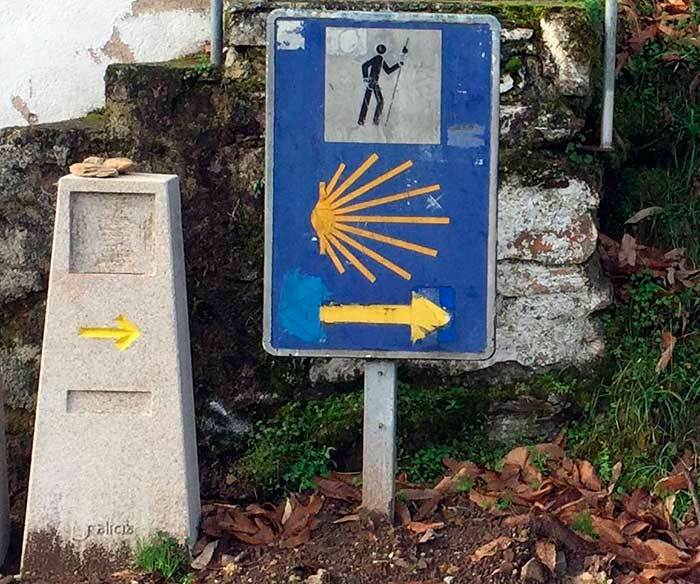 The general consensus is that it has been done at a great sentimental and financial cost_ as it is said that in 2015 and 2016 about one million Euros will be invested_ and it is an assault on the legacy of Elías Valiña who started marking the Camino with simple yellow arrows. There are even some ideas of what to do with such amount of milestones: some pilgrims are wondering if they could buy the old ones to put them in their own gardens as a souvenir of their Camino, but maybe the shipping is not as cheap as they would like due to their size and weight. Other pilgrims wish the old stone markers could be placed in the memorial pilgrim park of trees planned in Astorga or they could be placed in any other symbolic places of the Camino. What would you like to do with these old milestones? Put the old milestones back on the path, the new ones are without feeling and souls…. And the new ones with 3 decimals… Why? And no 100km stone, they changed the path, just asfalt!!! Time to find a new camino! Just leave the old one where they are and put up new one where needed.